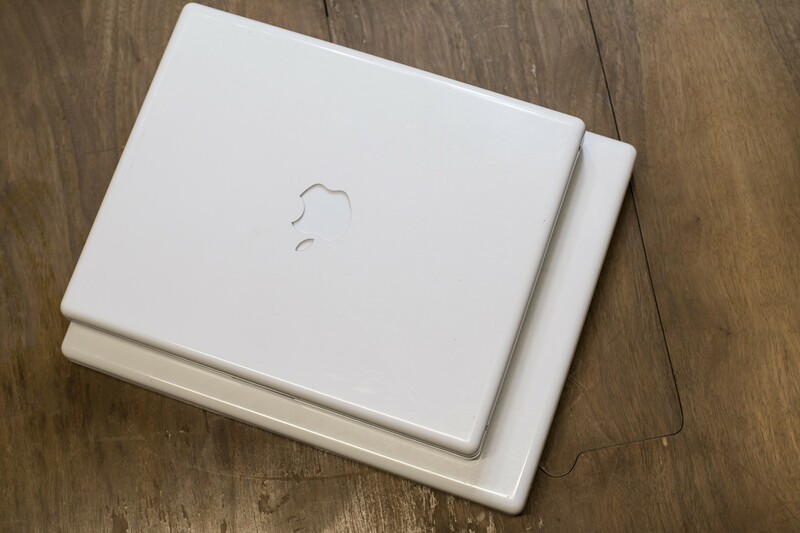 Last month, I took a look at the Clamshell iBook G3, the most colorful notebook Apple ever made. Introduced at Town Hall in 2001, the updated iBook G3 was a huge departure from the curvy, rubber-injected notebook it replaced. The official name of this iBook G3 is the "iBook (Dual USB)." As the name implies, this model put its new flat sides to great use, packing Ethernet, a Modem, 2 USB ports, Firewire 400, VGA and audio-out ports along the left-hand side. On the opposite side, the tray-loading optical drive sat flush with the case, without any of the awkward visual lines found on the Clamshell. The new notebook was smaller in every dimension, and weighed a full two pounds less than its curvy ancestor. Apple claimed 5 hours of battery life, and like the Clamshell, this notebook could be outfitted with an AirPort card. The notebook came with a 500 MHz G3 processor, and could be optionally specced with a CD-burning, DVD-playing Combo drive for $1799. Every six months or so, Apple bumped the specs of the machine to support faster G3 chips and (eventually) more RAM. This iBook shipped with a 12-inch, 1024 x 768 display, which Jobs touted as a huge improvement to the Clamshell's 800 x 600 resolution. He pointed out that Mac OS X really benefitted from the extra pixels, and he was right; OS X felt cramped and crowded on the older models. Jobs claimed that it was the first consumer notebook with this resolution of display. In his 2001 keynote, Jobs preached the value of wireless notebooks in the classroom. Instead of having a computer lab, he advocated a mobile-first approach using laptop carts that could travel to the students. At the time, Apple was leading the pack in terms of education customers, and he believed the iBook was going to allow Apple to stretch out its lead. The event wrapped with a conversation with the superintendent of the Henrico Country School District, which had ordered 23,000 of the new notebooks. In October 2001, Apple announced a 14-inch variant. Packing the same 1024 x 768 resolution but in a larger panel, the picture wasn't as good on this model, but if the number of 14-inch models I saw out in the world was any indication, most consumers didn't mind. It clocked in at 5.9 pounds. In October 2003, the iBook was upgraded to use a G4 processor. The G4 retained both the 12 and 14-inch sized options in slightly updated cases. This machine broke the 1 GHz barrier for the first time in a consumer notebook from Apple, while claiming an extra hour of battery life over the G3. The system also brought USB 2.0, Bluetooth support and 802.11g support via an optional AirPort Extreme card. The Early 2004 revisions brought twice the built-in RAM and an option for the DVD-burning SuperDrive, but otherwise was a speedbump to the proven recipe. 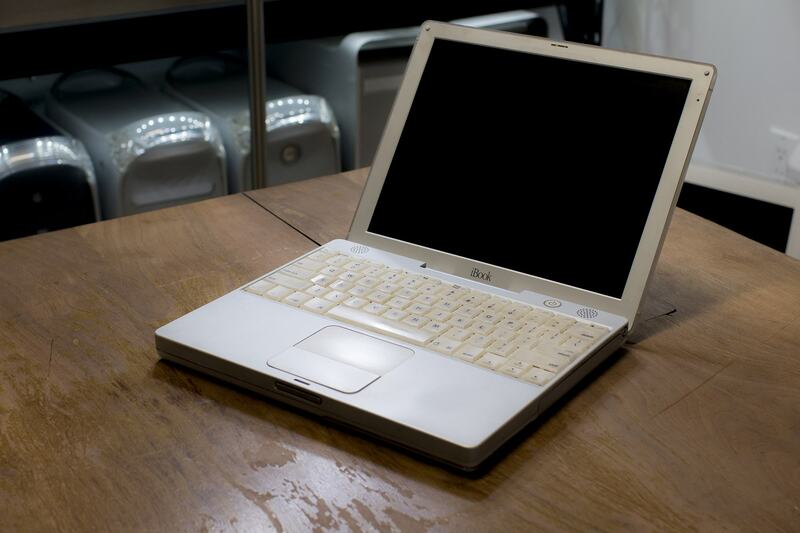 The iBook G4 saw two more revisions, the last coming in June 2005. Later models can run OS X Panther, Tiger or even Leopard. 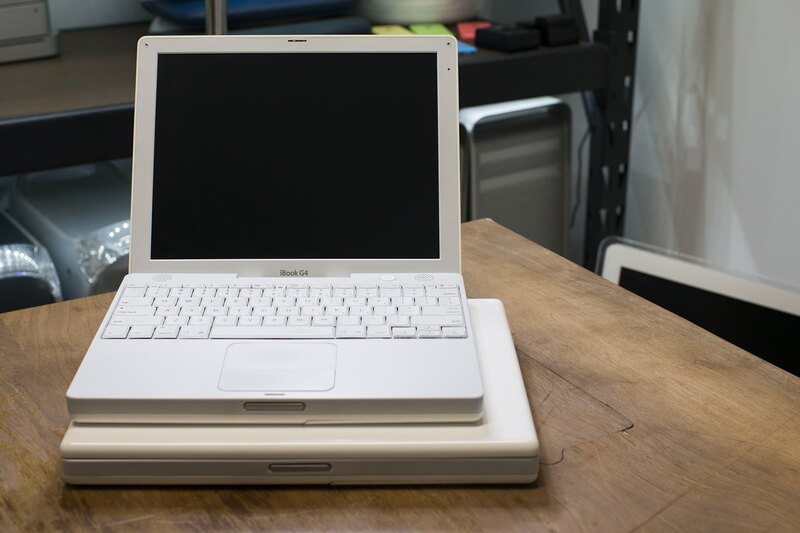 With 2006's Intel transition, the iBook met its end. 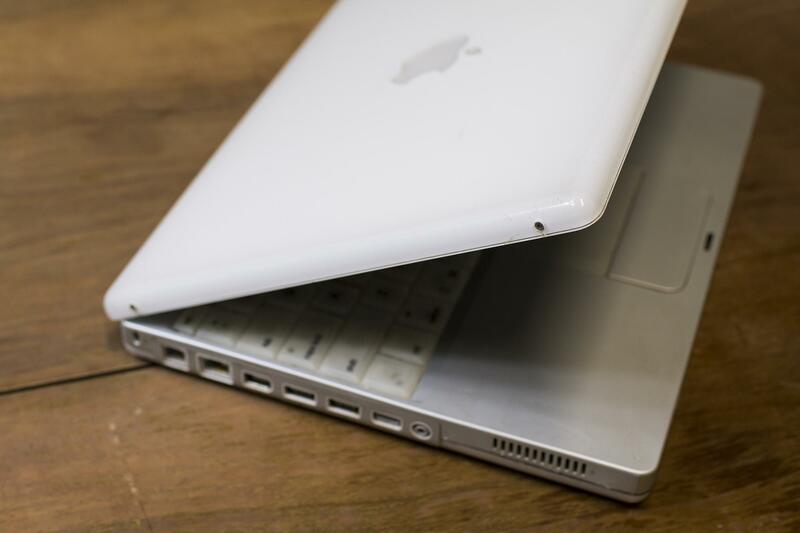 The 13.3-inch MacBook replaced both sizes of iBook with an all-new design and articheture.